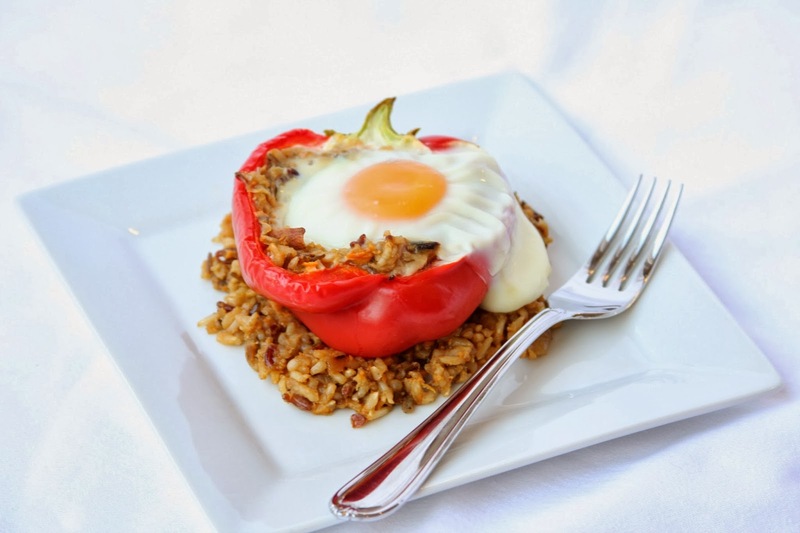 I have been searching for a really amazing stuffed bell pepper recipe. Every time I make them I think it will be the one. The keeper recipe. And every time, it’s just missing something. Well friends, this is the one! (cheering!) 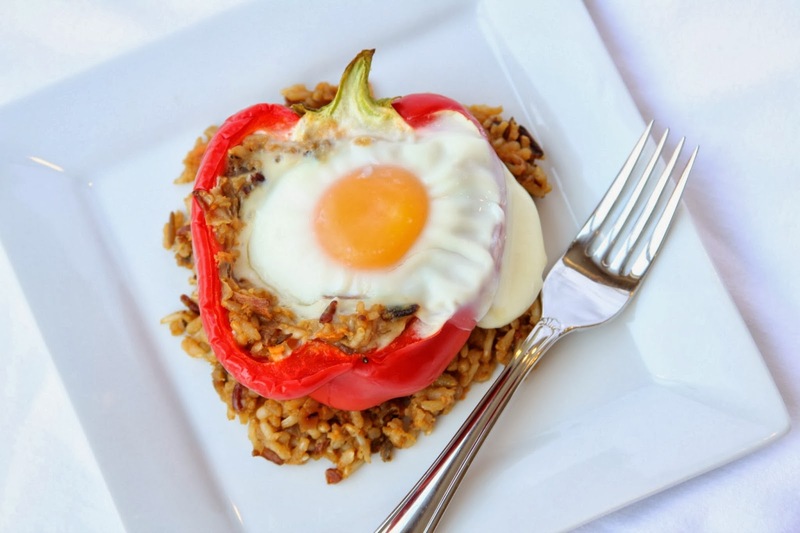 The egg really adds something to it, especially the runny yolk that becomes it’s own little sauce for the rice. My brother-in-law’s girlfriend came for dinner and she could not get over the wild rice! As I was cooking I kept thinking of things that sounded good, so in it all went! She really loved the sweet potato. 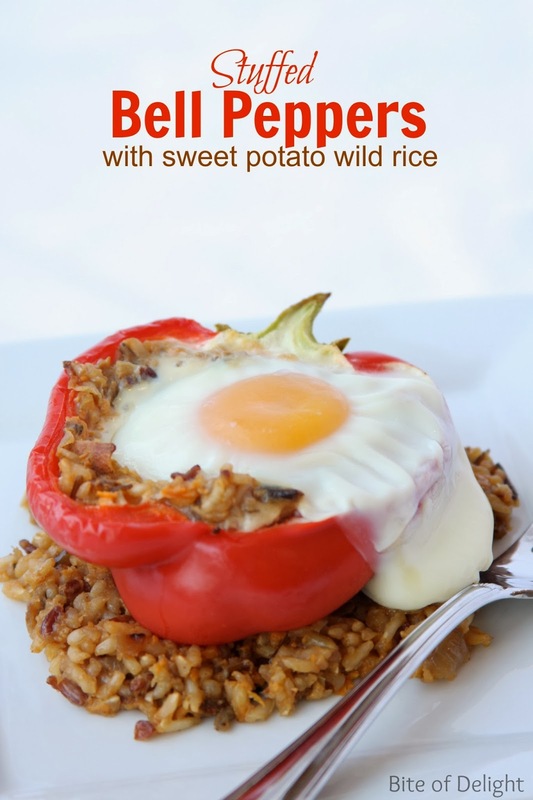 It adds a lovely sweetness, but it cooks so soft that it almost lends a creamy texture to the rice. And the leftovers are stellar. Bring the water to a boil and add the rice, beef base and 1 Tbsp coconut oil. Stir together, turn heat to low, and cover with a tight-fitting lid. Simmer for 30 minutes, or until a small amount of water remains. Meanwhile, cook the sweet potato and onion in remaining 1 Tbsp coconut oil over medium-low heat. While the rice is simmering and the sweet potatoes and onions are cooking, wash the bell peppers and cut in half lengthwise. Remove seeds and membranes. Place skin side down in a baking dish and add 1 1/2 cups water to the bottom of the dish. Cover with foil and bake at 400 degrees for about 15 minutes. When finished baking, remove from oven and drain water. When rice is done and sweet potato and onions are nice and soft, combine the mixtures. Add the garlic salt, curry & cayenne and stir. 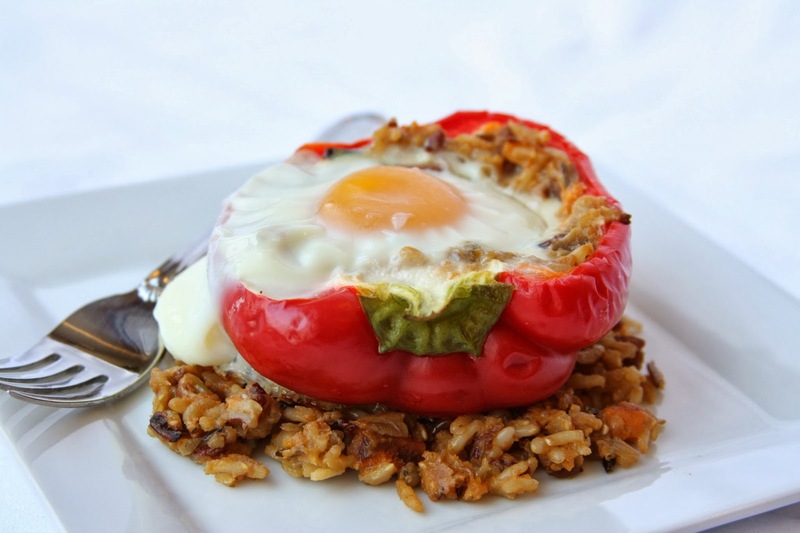 Fill the bell peppers with the rice mixture, leaving a large indentation in the middle for the egg. When all the peppers are filled, fill each indentation with an egg. My eggs were huge and ran over the sides a bit. If you think your eggs might run over, line your baking dish with foil for easy cleanup. 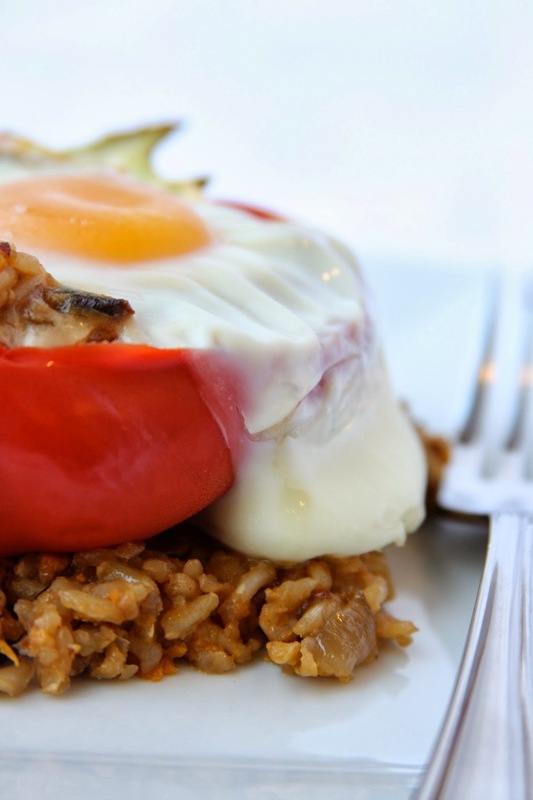 Place stuffed peppers back in the oven for about 15 minutes, or until the eggs are just set. 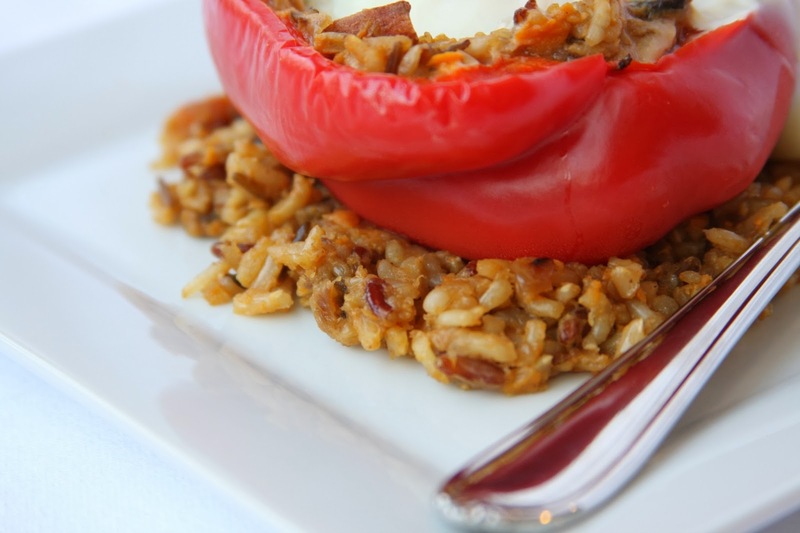 Serve over extra wild rice.